While cloud computing holds out the promise of operational efficiency and cost optimization, most big companies will be operating hybrid computing environments for the foreseeable future. As a result, cloud technology for many companies adds yet another layer on top of an already complex computing infrastructure. Seeing an opportunity to help IT departments work with developers and lines of business to optimize their hybrid computing environments, HPE is offering what it calls the first SaaS-based multicloud management application for on-premises and public clouds. Dubbed OneSphere, the software is being unveiled at the company's Discover Conference in Madrid Tuesday. "Hybrid IT is a given," said Rhett Dillingham, vice president and senior analyst at Moor Insights & Strategy, speaking on a webcast organized by HPE. As adoption of multiple clouds picks up steam, private cloud infrastructure investment continues for classic reasons of compliance and cost optimization as well as to support edge computing and IoT applications, Dillingham said. "You have these orchestration tools and cloud management platforms enabling multicloud and hybrid cloud use; what's turning into the challenge is the consolidated management across this hybrid infrastructure," Dillingham said. The problem is that the orchestration tools on the market now are limited, said Ric Lewis, senior vice president and general manager of the Software-Defined and Cloud Group at HPE. "They are very homogeneous; usually its virtual machines only, or VMs on or off-premesis, or VMs only in one public cloud vendor. OneSphere is open -- it has an open API so you can use it with whatever you want," Lewis said. When launched in January however, OneSphere will work only with AWS. HPE says that will be followed by support for Azure and Google. On-premises, HPE says OneSphere will support a range of cloud platforms including VMware and Kubernetes. In the future others will be added, including Open Stack and Azure Stack. 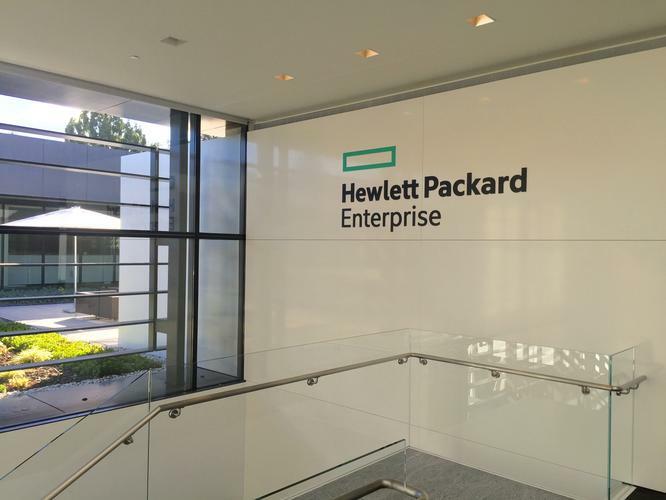 HPE also plans to work with Cloud 28, a coalition of 600 partners worldwide, to further expand the capabilities. 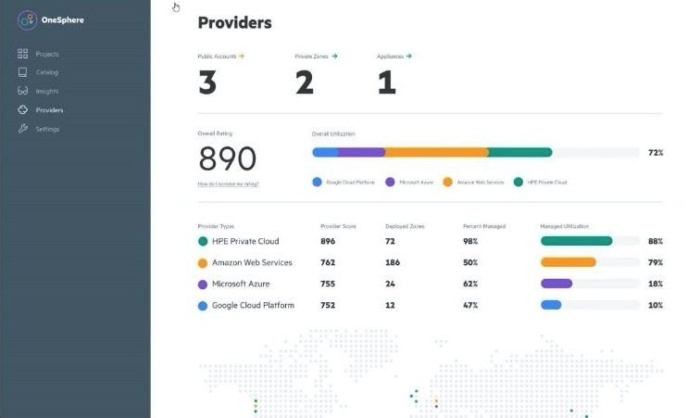 The interface for HPE's OneSphere gives a view of a company's utilization of multiple clouds. OneSphere was designed to make it easy to build private clouds and connect to public clouds, help developers get resources they need immediately, and give lines of business and executives insights to make operations more efficient. The software provides users access, via a SaaS portal, to a pool of IT resources that spans public clouds they subscribe to as well as on-premises environments. This is particularly important for developers because today's applications are virtualized, containerized and built as microservices, straddling clouds and sites, noted Lewis. OneSphere is designed to let them self-provision the resources they need with a few clicks in the portal, without waiting for their counterparts in IT operations to respond to request tickets. "OneSphere is built on a modern architecture using container-based services and Kubernetes orchestration, all running in a cloud environment," said Bryan Jacquot, user experience architect in the HPE's Software-Defined and Cloud Group. OneSphere can transform an existing virtual machine farm into a private cloud, Jacquot said. When VM farms are connected to the OneSphere platform, the existing VM deployments, templates and networks are automatically discovered though the self-service portal. Deployment of new physical and virtual infrastructure is similar. Users specify where hardware is geographically located and a virtual gateway is deployed on site to provide a secure communications link between the on-premises infrastructure and the SaaS platform. "Once this gateway is deployed you're able to compose bare metal servers into a new private cloud running VMware in a single click," Jacquot said. While putting provisioning power in the hands of users can speed deployment of resources and take a load off the IT department, administrators will also want to be able to impose some constraints. "The potentially scary part for people is that they can have users clicking these buttons and all of a sudden, oh my goodness, what's the credit card bill gonna be, what are they doing?" said Katreena Mullican, senior architect and cloud whisperer at the HudsonAlpha Institute for Biotechnology in Huntsville, Alabama. HudsonAlpha, a beta site for OneSphere, is a nonprofit organization with in-house researchers doing genomic research as well as extensive collaborations with a variety of outside scientists and organizations, all generating about 6 petabytes of data a year. It's a collaborative venture and data, compute power and research is shared. "We are the definition of hyperscale and hybrid IT," Mullican said. OneSphere offers role-based access control and a simple interface where the researchers themselves -- many of whom get cloud credits on different cloud platforms as part of their research grants -- can deploy resources and applications either on site or in the cloud. "What OneSphere does is it puts that provisioning power in the hands of the end users, the researchers. It enables a type of shadow IT which is not the negative type of shadow IT that you might hear about -- it's actually a useful shadow IT so that they can accomplish their research in a timely manner," Mullican said. "We’re saving lives here at HudsonAlpha through this research; I don’t want that delayed." But while Mullican doesn't want to throttle back resources, she welcomes OneSphere's controls. "As an administrator I need to be able to go into the tool and say, this is where you're allowed to provision, this is the maximum, whatever’s appropriate for the environment so I can sleep at night knowing these tools are out there, so it's a balance." OneSphere allows administrators to see utilization costs as they are incurred, Mullican notes. HPE also points out that OneSphere can provide a single view of usage and aggegate costs across all public clouds and on-premises deployments so line of business managers and CIOs can control and optimize resources and spending by cloud, site, line of business or subscriber. OneSphere is priced on a subscription consumption model.